Ann Leckie's debut novel, Ancillary Justice, has received quite a bit of praise since its October 2013 release. Depending upon the reviewer, the focus has been on the novel's treatment of gender, its SF elements, or its thriller-style plot. Normally, I do not mention others' impressions of a story, believing that it is better to focus more on my own personal evaluation of a fiction's strengths and weaknesses, but I mention this here because it is one of the rare few times that I've read a story and wondered just how so many others could praise this novel so highly without spending much, if any, time exploring its numerous and egregious flaws. Ancillary Justice is set in a remote galactic future thousands of years from now. Various human groups have colonized the galaxy and one, the Radch, has become the hegemonic power. Based in part upon the Roman Empire in its methods of integrating disparate traditions within an autocratic framework, a defining trait of the Radchaai is their use of human bodies, ancillaries, to house fragments of AI intelligences, many of which are in turn housed in interstellar-traveling ships. One of these ships, Justice of Toren, has mysteriously disappeared, leaving behind only a singular ancillary, known in the literary present as Breq, to begin a mission that quickly appears to be suicidal in nature. Many readers may find Breq/JoT/other ancillaries connected to the ship to be of interest. Leckie frequently shifts perspectives, sometimes within the space of a single page, in flashbacks that span nearly two decades in time. These shifts are not confusing, but they also are largely devoid of major differentiation in narrative voice. There rarely is the sense of anything being hidden within these flashback sequences; everything is spelled out in a laborious, expository fashion. This lack of narrative tension robs the plot of any real impetus; things are unfolding, in both present and flashback sequences, toward a conclusion that feels more perfunctory than anything else. I don't know the answer. But I do know that, though I can see hints of the potential split going back a thousand years or more, that's only hindsight. The first I noticed even the bare possibility that I – Justice of Toren might not also be I – One Esk, was that moment that Justice of Toren edited One Esk's memory of the slaughter in the temple of Ikkt. The moment I – "I" was surprised by it. Next morning I bought clothes. The proprietor of the shop Inspector Supervisor Skaalat had recommended was on the verge of throwing me out when my bank balance flashed onto her console, unbidden I suspected, Station sparing her embarrassment – and simultaneously telling me how closely it was watching me. I needed gloves, certainly, and if I was going to play the part of the spendthrift wealthy tourist I would need to buy more than that. But before I could speak up to say so, the proprietor brought out bolts of brocade, sateen, and velvet in a dozen colors. Purple and orange-brown, three shades of green, gold, pale yellow and icy blue, ash gray, deep red. There are times when colorful detail can add to the story, but in this case, any momentum derived from the character disguising herself in order to carry out her mission is lost in this swamp of extraneous description. If this were a singular or even occasional issue, it would not have stood out so vividly here, but all-too-frequently Leckie confounds description for scene/character development. This leads to a narrative that feels hollow, where the backdrop becomes more important than the characters moving through these scenes. Even when it comes to Leckie's use of non-differentiated gendered pronouns is lacking in substance. Yes, there are times when the narrator's use of "she" for even obviously male characters makes the reader pause and consider her own reactions, but rarely does this go beyond the surface-level of characterizations. There is so little apparent differentiation in the actions and customs of these other characters that it was very easy to perceive them all as a homogeneous mass largely devoid of defining traits. Without any substantive differences in Breq/One Esk's perspectives versus the other characters' own self-perceptions, the lack of any palpable tension in these potentially conflicting identities renders this presumed subversion of gender/character expectations moot, as there is really nothing to react to after the initial realization (spoiled in part upon Breq/One Esk's musing on it in the first chapter) that not all "shes" are hers. This failure to realize adequately the author's presumed aims in treating gender is but only a symptom of a larger malaise. The prose on the whole attempts to describe an alien setting, but instead it feels bland and largely devoid of anything interesting when it comes to setting, plot, or character interactions. Beyond the examples I listed above, there is nothing truly wretched about the story, but there certainly is little that makes it memorable either. In trying to think of a single word that could sum up Ancillary Justice, the first word that came to mind was "lukewarm." There is nothing obviously offensive about the work (unless one wants to spend more time wondering why the morally-questionable practice of using the corpses of potentially-enslaved – the narrative does not spend enough time on the issue to determine if this may indeed be the case – people as the corpse-soldier ancillaries is not addressed), but ultimately there is really nothing praiseworthy about the narrative as well. The characterizations are not well-developed, but nor are they completely devoid of dynamism. The plot was rather subdued, but has enough points of interests to keep it from being a complete chore to read. 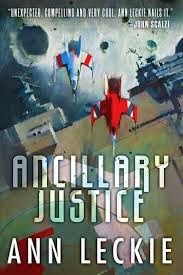 Ancillary Justice is the sort of bland narrative that makes it difficult for me to conceive of reading any future installments in Leckie's proposed trilogy. One of the more disappointing 2013 releases that I have read. Awesome review, but kinda a shame: this has been on my radar for a while now, but having read this, I think it's been pushed down my list a little. Excellent review, Larry. Very glad to see your thoughts on the novel, which helped to give more focus to my problems with the novel. On the whole, for me, all the praise I saw for the novel left me with a similar lukewarm feeling. Or rather, that the novel was simply "there." Shifts in time/perspective should have some impact and have a reason for occurring but as you say, they seemed far too matter of fact. Thanks for the insightful review Larry, I've had similar reading issues with it (as mentioned by Robb above). You though have crystallized them clearly. I enjoyed the setup for the story, but couldn't really go beyond that in its praise. This is really one of those different strokes kinda books. Yeah, it's a thoroughly mediocre novel in virtually every aspect. I hate to think this, but this seems to be one of those novels that appeals to some more on its premise than for anything that Leckie actually manages to accomplish in this novel. Simone de Beauvoir or Assia Djebar this most certainly is not. just finding this post now (yes, I live under a rock). we had similar thoughts on the book, were both very disappointed. would the book have gotten so much positive attention if the language only had words for the male gender? Even though the narrator is omniscient in places, maybe you should not entirely trust her. Yes, backdrop is very important in this novel. Personally, I enjoyed the texture of the societies in the novel, and I enjoyed inhabiting the headspace of a very competent but also damaged person.